Los Angeles has long been a city packaged and sold by its boosters. 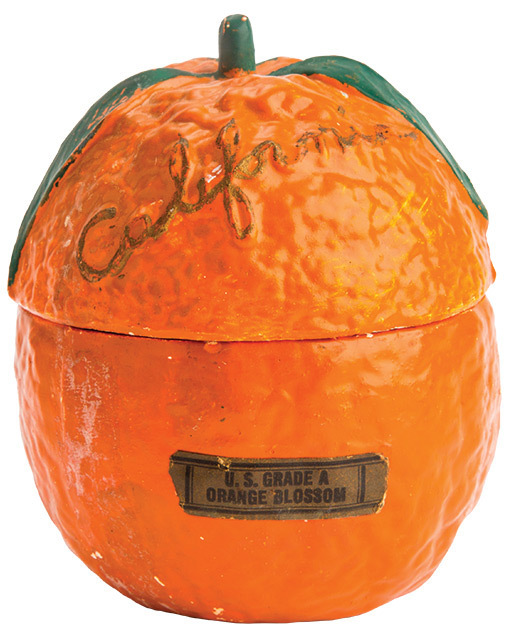 From 1900 to 1930, the population ballooned from 100,000 to 1.2 million, and behind that expansion was a sustained branding strategy built around the mystique of a single item: the orange. Spanish missionaries in San Diego planted the first California orange trees in 1769, but it wasn’t until the 1870s that an endless belt of groves transformed Los Angeles into what became known as the Orange Empire (parts of which are now the Inland Empire). 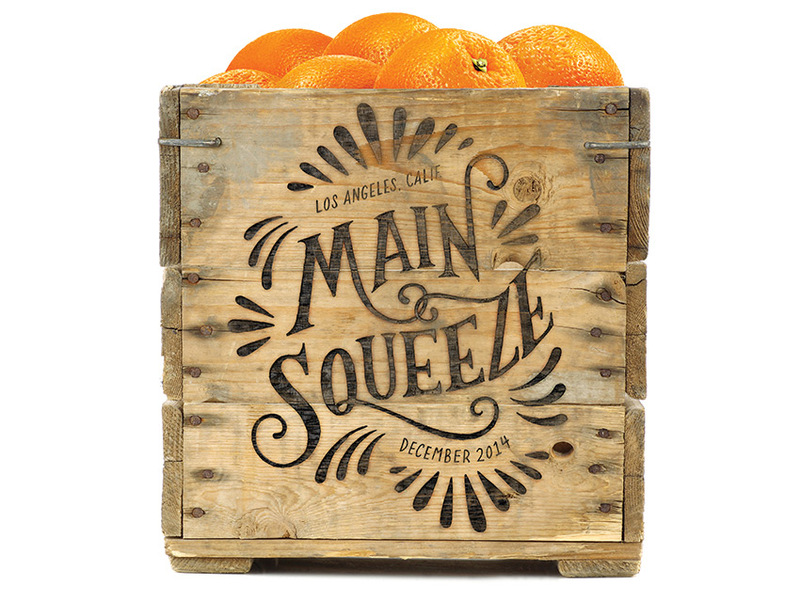 In 1920, citrus was second only to oil among California’s industries, and by 1924, more than 52,000 acres of trees in Los Angeles County were producing about 20 million boxes of the sun-kissed citrus annually. 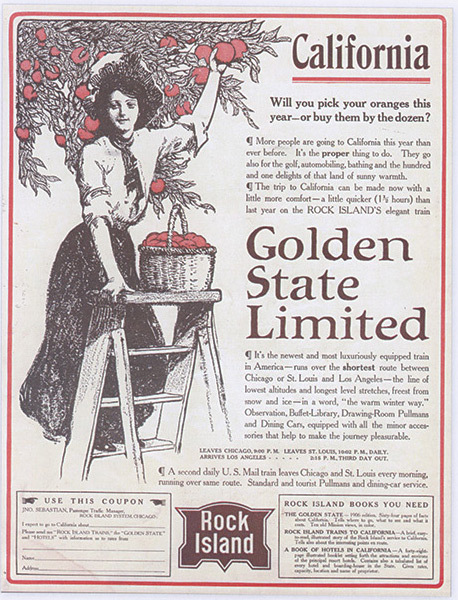 To market their produce for consumers in the Midwest and on the East Coast, growers formed a cooperative whose innovative national advertising campaigns (a first for fresh fruit) sold more than just a product. They offered sunshine, health, and wealth, three hallmarks of the Southern California lifestyle. A brilliant proprietary name—Sunkist—also helped whisk Americans away to the Golden State every time they peeled one of its “golden apples.” But many wanted to see the idyllic, fragrant groves for themselves, and L.A. advocates were eager to capitalize on the city’s association with the fruit. Soon millions of visitors were traveling west, and many later returned as permanent residents. Though California’s citrus industry eventually retreated north into the Central Valley as a result of suburbanization, it left behind a colorful paper trail—one richly documented in the region’s historical archives. Citriculturist David Boulé’s recent book on the subject, The Orange and the Dream of California (Angel City Press), showcases thousands of artifacts related to the orange industry (some of which appear on these pages). The images recall a time when Southern California’s most notable features weren’t its endless beaches or regal mountain ranges but a palm-size fruit with a prodigious reputation. 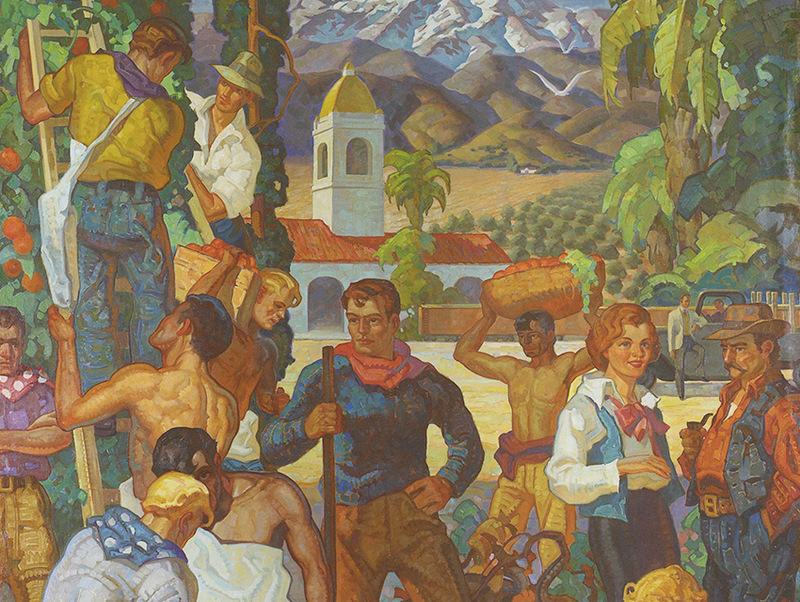 Created in 1935 for Sunkist’s L.A. headquarters, this wall art virtually ignores the immigrant laborers who attended to the backbreaking work of citrus production. 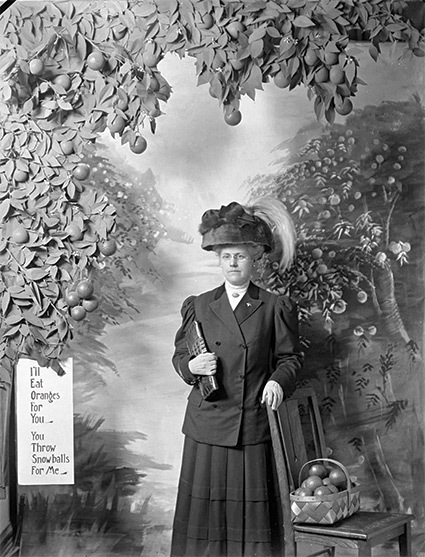 Vacationers attracted new arrivals by sending citrus-related mementos across the country. Pasadena’s Flag photography studio specialized in custom photo cards, which were meant to entice snowed-in relatives back east. Transcontinental railroads often collaborated with the citrus industry on flyers like this one. In 1908, Southern Pacific and Sunkist promoted “Orange Week” in Iowa: Trains filled with fruit crisscrossed the state, bearing banners that read Oranges for Health—California for Wealth. After visiting the groves, tourists would take home keepsakes—everything from orange blossom perfume to decorative ceramic pieces. These served to present “California as a place of dreams,” Boulé notes in his book. 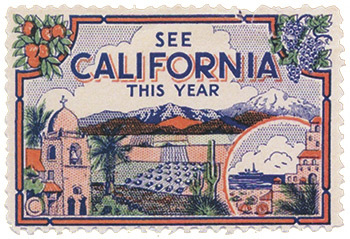 Oranges figure prominently alongside other California icons such as palm trees and Spanish missions on this promotional poster stamp. 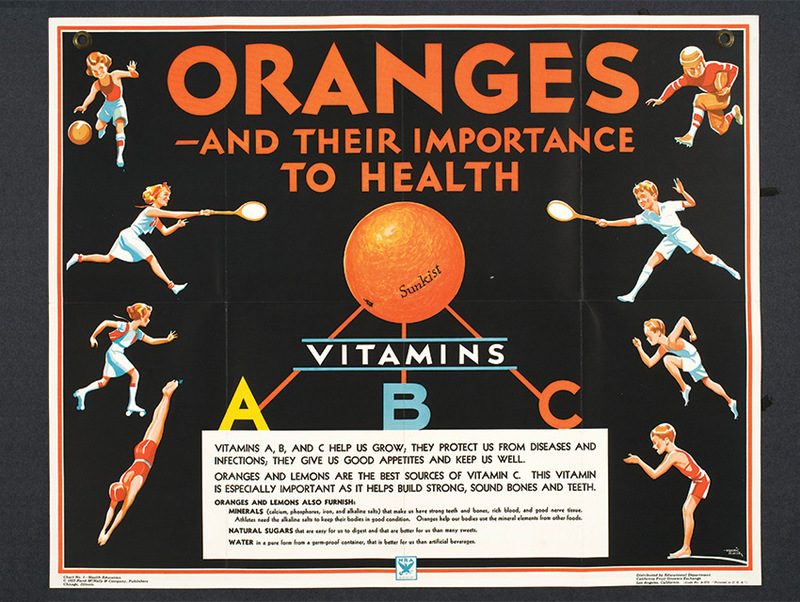 Print ads touted the health benefits of oranges, describing the fruit in almost medicinal terms. Los Angeles was already famous for attracting “lungers,” who sought relief from tuberculosis during the region’s warm, dry summers and mild winters. Now Americans everywhere could commune with L.A.’s salubrious climate simply by biting into an orange. 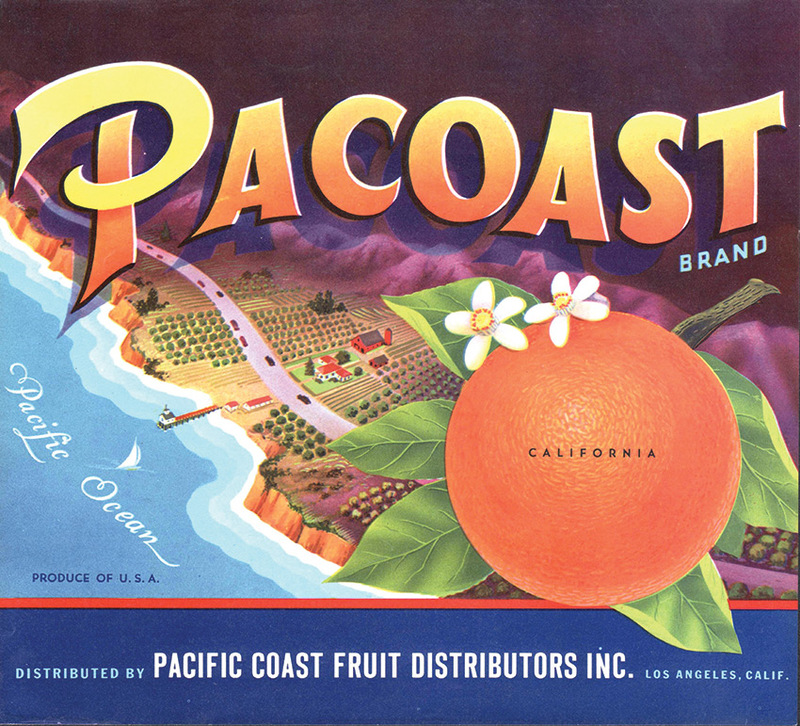 The vivid graphics on wood orange crates shipped cross-country invited people to drink in the Southern California lifestyle. Travelers proudly wore pins as proof that they’d seen the city’s latest bumper crop. 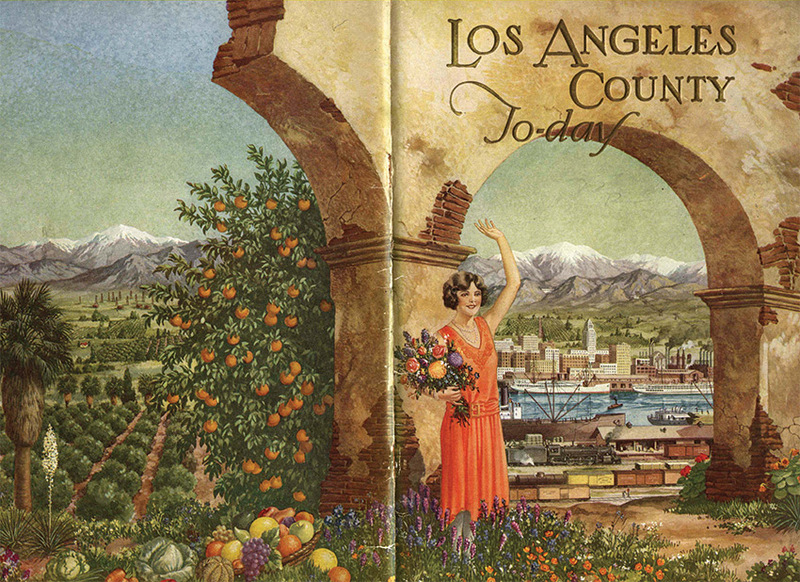 The color orange is front and center on the covers of this 1929 chamber of commerce booklet. The handout has been preserved at Cal State Northridge’s Oviatt Library.